We chose a 3 night Sydney - Burnie - Melbourne cruise as a sampler and introduction to Cunard cruising. Embarkation was reasonably painless. We arrived a little earlier than the allocated boarding time and was told to board anyway. We dropped off bags, queued for about 15 minutes and then found ourselves on-board. Finding our cabin was easy as we were escorted by our cabin steward who did a good job of explaining our cabin facilities. The cabin was comfortable and clean, though no larger than what we&apos;ve previously experienced. Power is via British and American sockets, which is no problem, but there were no USB sockets. The bathroom was small but everything worked as expected. The bed was comfortable, but I found the pillows too soft. A nice touch was a complimentary bottle of sparkling wine on ice in the cabin. As a tip for Cunard though, next time source a wine that is drinkable. Two lunches and breakfasts were in the Lido buffet. As a buffet, the food was reasonable quality with a good variety. Shouldn&apos;t have to pay extra for espresso style coffees though. One lunch and dinners were in the Britannia Restaurant. This was disappointing. The food was no better than a reasonable RSL club bistro. The service was reasonably attentive though a little hit and miss. After our first night&apos;s dinning I found myself with someone else&apos;s keycard. This was quickly fixed up at the purser&apos;s office and provided a lesson to check the card after purchases. A highlight of the food experience was the high tea, which we experienced on our second day. Being our only day at sea, it was very popular and the overflow ended up in the Britannia Restaurant. The tea (or coffee) was plentiful and hot, the food, sandwiches, scones and sweets, were spot on and the service was attentive. Drink prices were on the expensive side, especially once you remembered to convert from USD and add the gratuity. Being Australian, gratuities, and tipping in general is a pain. If it is part of the standard or expected cost, just roll it into the overall price and be done with it. Then we can decide to tip if we feel the service deserves it. Overall though, the service was good. We didn&apos;t take in a show but did experience some of open the entertainment on other nights. The bands were what you would expect and reasonably entertaining. We took in a talk by a historical expert regarding WWII Japanese hold-outs (refusing to surrender after the war) in the Pacific. I found this interesting as I enjoy the historical aspect, but it wasn&apos;t to my wife&apos;s taste. My wife though did sample the shopping, fortunately without much success. Our one port day was in Burnie, Tasmania. This a good, honest working town, but not a very inspiring cruise destination, especially as it was a public holiday and would have been completely dead if it weren&apos;t for hundreds of cruise passengers wandering around looking for something to do. There were very few cafes and you couldn&apos;t even have a beer and lunch in a pub as they were all closed. At least the mayor was there to greet us when we came down the gangway. We didn&apos;t do any organised shore excursions, but my sister, who was part of our cruise group, did, and enjoyed the Cradle Mountain excursion. 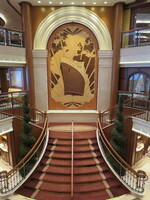 Overall, the ship had a decor in keeping with it&apos;s image and wasn&apos;t overcrowded. We weren&apos;t disappointed, but now feel we&apos;ve done the Cunard experience and probably won&apos;t be sampling it again. We are going on a longer Oceania Mediterranean cruise later this year. It will be interesting to compare that experience. We chose a 3 night Sydney - Burnie - Melbourne cruise as a sampler and introduction to Cunard cruising. Embarkation was reasonably painless. We arrived a little earlier than the allocated boarding time and was told to board anyway. We dropped off bags, queued for about 15 minutes and then found ourselves on-board. Finding our cabin was easy as we were escorted by our cabin steward who did a good job of explaining our cabin facilities. The cabin was comfortable and clean, though no larger than what we&apos;ve previously experienced. Power is via British and American sockets, which is no problem, but there were no USB sockets. The bathroom was small but everything worked as expected. The bed was comfortable, but I found the pillows too soft. A nice touch was a complimentary bottle of sparkling wine on ice in the cabin. As a tip for Cunard though, next time source a wine that is drinkable. Two lunches and breakfasts were in the Lido buffet. As a buffet, the food was reasonable quality with a good variety. Shouldn&apos;t have to pay extra for espresso style coffees though. One lunch and dinners were in the Britannia Restaurant. This was disappointing. The food was no better than a reasonable RSL club bistro. The service was reasonably attentive though a little hit and miss. After our first night&apos;s dinning I found myself with someone else&apos;s keycard. This was quickly fixed up at the purser&apos;s office and provided a lesson to check the card after purchases. A highlight of the food experience was the high tea, which we experienced on our second day. Being our only day at sea, it was very popular and the overflow ended up in the Britannia Restaurant. The tea (or coffee) was plentiful and hot, the food, sandwiches, scones and sweets, were spot on and the service was attentive. Drink prices were on the expensive side, especially once you remembered to convert from USD and add the gratuity. Being Australian, gratuities, and tipping in general is a pain. If it is part of the standard or expected cost, just roll it into the overall price and be done with it. Then we can decide to tip if we feel the service deserves it. Overall though, the service was good. We didn&apos;t take in a show but did experience some of open the entertainment on other nights. The bands were what you would expect and reasonably entertaining. We took in a talk by a historical expert regarding WWII Japanese hold-outs (refusing to surrender after the war) in the Pacific. I found this interesting as I enjoy the historical aspect, but it wasn&apos;t to my wife&apos;s taste. My wife though did sample the shopping, fortunately without much success. Our one port day was in Burnie, Tasmania. This a good, honest working town, but not a very inspiring cruise destination, especially as it was a public holiday and would have been completely dead if it weren&apos;t for hundreds of cruise passengers wandering around looking for something to do. There were very few cafes and you couldn&apos;t even have a beer and lunch in a pub as they were all closed. At least the mayor was there to greet us when we came down the gangway. We didn&apos;t do any organised shore excursions, but my sister, who was part of our cruise group, did, and enjoyed the Cradle Mountain excursion. Overall, the ship had a decor in keeping with it&apos;s image and wasn&apos;t overcrowded. We weren&apos;t disappointed, but now feel we&apos;ve done the Cunard experience and probably won&apos;t be sampling it again. We are going on a longer Oceania Mediterranean cruise later this year. It will be interesting to compare that experience. Average size, clean and comfortable, everything worked though a little dated.